Charter of the Forest | Notes from the U.K.
A man was arrested in October for trying to steal a copy of the Magna Carta. Or–depending on what news source you like–on suspicion of trying to steal it. It happened in Salisbury, where it was on display in the cathedral, so for all we know he may have been a public-spirited citizen who wanted the city to be known for something other than novichok poisonings. But enough about him. Let’s talk about the thing he was trying to steal. We’ll start, while we still remember that someone tried to steal it, by saying that only four copies of the 1215 Magna Carta survive. They’re written by hand (as everything was in those days) and in Latin (as everything that mattered was). In 2015, a version from 1300 was found in the archives in Maidstone, Kent. Stay with me and you’ll see why they have different dates. It had somehow gotten filed inside the pages of a Victorian scrapbook and was (don’t ask me how these two facts can coexist) cuddled up next to a Charter of the Forest. We’ll get to the Charter of the Forest eventually, but in the meantime we can pretend it was in the scrapbook as well. 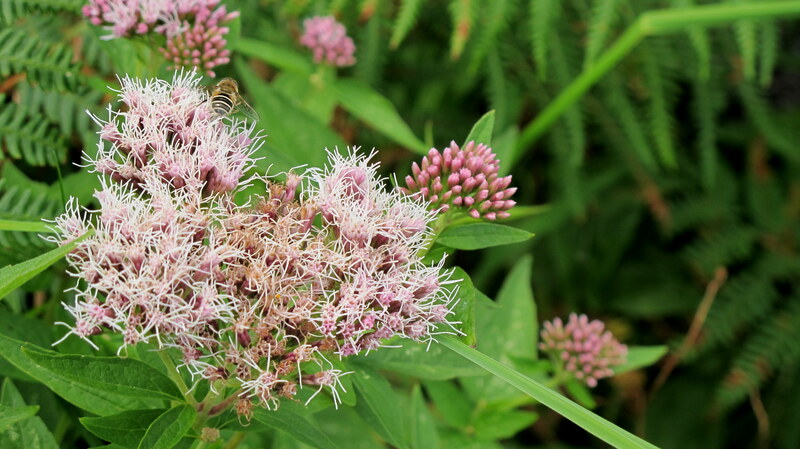 Irrelevant photo: hemp agrimony–a wildflower. Part of this newly found version of the Magna Carta is missing, but it was still valued at around £10 million. So stealing one? Yeah, you could make a few bucks that way. Or quid, if you prefer. But put your wallet away, because it’s not for sale. It belongs to the town of Sandwich, which decided to use it as tourist bait. Presumably it’s worth more that way, at least in the long run. The find supports the belief that the Magna Carta was issued more widely than historians had thought–that it was sent to at least fifty ports and cathedral cities. So let’s talk about what the Magna Carta is and why it matters. The story starts, or at least can start, as many stories from this period of English history do, with the English fighting in France, parts of which belonged to England. Or at least the English thought they belonged to England, and so did what passed for international law at the time. We’ll skip the details. What matters is that however many times England won or everyone involved worked out a peace deal, France was still across a big damn chunk of water, England’s French lands were still on the other side of the aforesaid water, and the next thing anyone knew everyone involved was fighting again. That’s why I feel free to skip the details. Just when you get the kids all settled down to eat a meal in peace, they start the whole thing over again. If it’s not fighting over who said what to who, it’s over who lost the remote and who was the first one to throw food. Besides, we’ve already got a long post here. All that fighting took money. Lots of money. And that money had to come from somewhere. Keep that in mind while we swerve left to avoid a pothole and explore a bit of church history. In 1205, the archbishop of Canterbury died. The monks of Canterbury and King John couldn’t agree on the next archbishop, so they appealed to the Pope (if that sounds peaceful and cooperative, it wasn’t), who had a third candidate in mind. King John did what any sensible adult would do in that situation, he banished the Pope’s candidate, and the Pope did what any pope would do and placed an interdict on the country, which meant that no religious services could be held. Church bells couldn’t be rung. According to one source, people couldn’t be buried, but I seriously doubt they were left lying where they dropped. Let’s agree that for the sake of public health they were put in the ground but without the religious rituals that people of the time considered necessary. Eventually, the Pope excommunicated John, which meant his subjects were freed from their oaths of allegiance and the French were free to invade, which they did, although not until a sentence and a half from now. John felt free to confiscate church property, which he did. Then he sold it back to the church, making a profit that he used, in part, to create a navy, which he used first to invade Ireland (in case he didn’t have enough trouble) and then to defeat the French invasion that happened at the beginning of the paragraph, which has been in suspension until we got to this point. John’s excommunication also gave some of his barons the excuse they needed to start plotting against him. John grew suspicious. Tensions rose. John accepted the Pope’s candidate for archbishop, humbled himself publicly, and paid 100,000 marks to compensate the church for the trouble he’d caused. That got him re-communicated. Tensions fell. Everyone kissed and made up and buried the dead bodies they’d left lying around, but none of them (that’s the living people, not the dead) liked each other any more than they had before. Then John invaded France. It didn’t go particularly well and he returned to England trailing a whiff of cowardice, at which point the barons who’d been plotting rose against him, because if there was one thing aristocrats of the era couldn’t stand it was the scent of cowardice. The accusations of cowardice may or may not have been justified, but it didn’t matter. They’d been in conflict with him for a long time and this was a great excuse, so a few of them met with the Pope’s shiny new archbishop (who might just possibly have harbored a resentment or two) at Bury St. Edmunds and swore to fight the king if he didn’t grant them a charter. Keep the thought of a charter in your mind while we wander off again. The story’s full of potholes. We’ll get to the charter eventually. A few barons put clothespins on their noses to block that whiff and declared for John, but most of them burrowed deep in their beds and waited to see who’d come out ahead, John or the rebels. A few baronial families did even better than that: They split their allegiance, planting family members on both sides. Whatever happened, the family would come out ahead. You might want to think of that as relative extreme poverty. They were still barons. Their poverty would’ve been a peasant’s most outrageous dreams of more-than-plenty. The newly re-communicated King John got the Pope’s backing against the rebel barons, so he had god’s support and could take the field as a crusader. The Pope excommunicated the rebels, but they also had god’s support–they declared themselves the Army of God and the Holy Church, even if the church was backing the other side. If you believe in the same god they did, you can assume that he was, at best, confused and might understandably have decided to sit this dance out. The barons responded by besieging Northampton, where John defeated them, but London opened its gates and FitzWalter and his Army of God marched in. King John, with his own lower case army of god, held onto the Tower of London. The two sides negotiated and eventually met at Runnymede, a field of no particular distinction at the time but now famous for being the place where they met, where they’d agreed that John would sign the Magna Carta, which wasn’t called that yet and was the same thing John had called an era-appropriate version of “this piece of crap.” It guaranteed the rights of the Church–an interesting provision, given that the rebels were still excommunicated. It also limited some of the ways the king could exploit feudal customs, confirmed people’s rights under Common Law, and protected the barons’ from any repercussions of their rebellion. One clause said twelve knights would be elected within every county to investigate abuses by sheriffs, foresters, and other royal officials. Another set up a committee of barons to enforce the settlement. In return, the rebels promised to surrender London. Both sides crossed their fingers behind their backs and John signed. Neither side kept its side of the bargain, or meant to. The rebels kept London. For his part, John sent out copies of the charter but put the sherriffs in charge of investigating abuses by the sherriffs and their cronies. He also sent a copy to the Pope, who (as John had expected) promptly nullified it. He wasn’t about to have either a king–or by extension, a pope–rule under the supervision of his subjects. But for all that no one planned to abide by it, the charter bought both sides a short stretch of peace, which was all they’d hoped for. Then the two sides were fighting again. You had the remote last. Yeah, but you threw mashed potatoes at me. With gravy. The rebels offered the English crown to Prince Louis of France. Predictably enough, Louis’ proud father, Philip, sent troops. Things looked bleak for John. By now, a good two-thirds of his barons had gambled on the French, and John and his troops were being harried through the countryside. If that wasn’t embarrassing enough, when his army and, more importantly, his baggage train were crossing some muddy tidal flats of Lincolnshire that are called the Wash, a rising tide swept away his treasury and the crown jewels. The land there is flat and the tide, according to the BBC, which knows these things, can rise faster than a running man. Or, presumably, woman. At the full and new moons, it can outrun a horse without stopping to ask if it’s male or female. It was all looking pretty grim for John when he played a card that turned a losing hand into a winning one: He caught dysentery and died, the clever devil. His son was crowned Henry III and he reissued the Magna Carta, which left the rebels without much to rally around. Barons changed sides and suddenly the French troops looked more French and less English than they had a few minutes before. The war changed from a civil war to a war of resistance against the French. Louis was defeated, in a nice bit of balance, at Sandwich, which appeared early in our post, making a sandwich of the intervening potholes, detours, and information. Less helpfully, he was also defeated at Lincoln, which has nothing to do with our tale. And the Magna Carta? It was re-reissued in 1225 and again whenever the king and some element of his country were at odds with each other. In the 1270s, the Church demanded that a copy of Magna Carta be displayed on the door of every major monastery and every cathedral church. What made the Magna Carta so important? Well, it made the king subject to the rule of law. That was not just new, it was shocking. It established the idea that taxation depended on the consent of the kingdom. A few hundred years later, the American Revolution dropped that thought into the social media of the time and it went either bacterial. Or viral–no one knew the difference then. It–it being the Magna Carta here–also made taxation all the more necessary because it blocked many other sources of kingly revenue. So the great and powerful (although sub-royal) would now have to be summoned to give their consent to new taxes, and that opened the door, for the first time, to what would become a parliament. Now let’s go back to the Charter of the Forest, which you could be forgiven for having forgotten was found sandwiched in with the Magna Carta in the Sandwich archives. The Charter of the Forest was issued in 1217, when Henry III issued a new version of the Magna Carta. By then, roughly a third of the country (or of southern England, depending on your source) had become royal forest, and the king made a big honkin’ chunk of money from fining people for various offenses within its bounds. The charter reduced its area by un-foresting everything that had been added since Henry II’s time. It also got rid of capital punishment and mutilation for poaching (which is basically hunting game that belongs to some aristocrat). People could still be fined or imprisoned for poaching, but hey, they weren’t being killed or mutilated. Progress has a bleak sense of humor. It allowed free men (notice the limitations there) who had woods within the forest to put up buildings and clear land for farming. How can people have woods within a forest? Forest, as it turns out, didn’t mean forest. Ever since the Normans conquered England, it meant an enclosed area claimed by a king or lord, along with all the huntable animals in it and the vegetation they fed on. A forest could be forest, grassland, wetlands, whatever–blue sky, presumably, if you could enclose it. The royal forest grew big enough to create a hardship for people trying to do frivolous things like farm, fish, gather fuel, pasture animals, and generally feed their families. Where the Magna Carta was most immediately about the rights of the powerful, the Charter of the Forest was about common people’s rights. Some of its clauses stayed in force until the 1970s. At the same time that the Charter of the Forest was issued, the Magna Carta was modified so that widows could refuse to remarry and could retain some of their husbands’ land and their rights to the common, which meant they could still make a living–a reduced one, but better than what they’d been able to do before. It was the Charter of the Forest that established the name of the Magna Carta, which wasn’t called the Great Charter because it was fantastic, wonderful, and better looking than your average charter. It was bigger than the little charter–the Charter of the Forest. Calling it Magna was a way to keep them straight. The Charter of the Forest isn’t as well known as the Magna Carta, but for hundreds of years every church had to read it out four times a year. It provided a legal basis for commoners–meaning people with a right under feudal law to use a common plot of land–to defend that right for centuries to come. England has never had another king named John. Someone left me a comment about the Charter of the Forest a good long while ago. I’d never heard of it and without that shove wouldn’t have found it. The information’s easy enough to find, but even so you won’t find it unless you look. My thanks, and my apologies for losing track of who you are. Give me a shout and I’ll post a link to your blog.